In the 1940s the American Federation of Musicians of the United States and Canada chartered groups of writers and performers in Toronto, Winnipeg and Vancouver called the Association of Canadian Radio Artists. Local 24498 of the Association was located in Vancouver. In 1963 the organization's name was changed to the Association of Canadian Television and Radio Artists (ACTRA). All records were centralized, and a national office was established in Toronto. The B.C. Branch of ACTRA was founded in 1963. The organization assumed its present name in 1983. The fonds consists of minutes (1949-1983), subject files (1952-1984), agreements (1960-1985), constitutions and by-laws (1963-1985), membership cards and applications (1963-1984). Also included are records of the Writers' Guild (B.C. 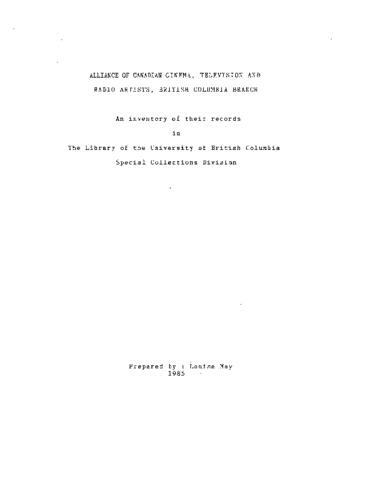 Branch) which consist of correspondence (1977-1985), minutes of the B.C. Branch (1980-1984), minutes of the ACTRA Writers' Guild national meetings (1977-1985), papers and reports (1979/80) and a Writers Directory (1981).